U.S. Secretary of State Mike Pompeo and Israeli Prime Minister Benjamin Netanyahu shake hands as they deliver joint statements during their meeting in Jerusalem, March 20, 2019. U.S. Secretary of State Mike Pompeo and Israeli Prime Minister Benjamin Netanyahu are vowing to counter what they call Iran's aggression in the Middle East. "We need to increase it, we need to expand it, and together the United States and Israel are working in close coordination to roll back Iranian aggression in the region and around the world," Netanyahu said Wednesday, noting U.S. pressure on Iran is already having an impact. He made the comments after regional security talks with Pompeo, who arrived in Israel from Kuwait earlier in the day. During Wednesday's talks, Netanyahu and Pompeo emphasized the closeness of the U.S.-Israeli relationship and vowed to deter Iranian threats to Israel. Both leaders also announced President Donald Trump will host Netanyahu at the White House next week. 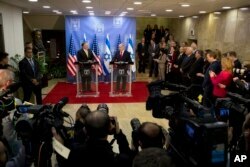 Israeli Prime Minister Benjamin Netanyahu, right, and U.S. Secretary of State Mike Pompeo deliver joint statements at the Prime Minister's office in Jerusalem, March 20, 2019. The Israeli prime minister thanked the U.S. secretary of state for the Trump administration's support for Israel and the U.S. withdrawal from the 2015 Iran nuclear deal, calling the decision "historic." Pompeo noted what he called threats toward Israel from Iran's Ayatollah Khamenei. "The Ayatollah has declared that the annihilation and destruction of Israel is his primary goal," Pompeo said. "With such threats a daily reality of Israeli life, we maintain our unparalleled commitment to Israel's security and firmly support your right to defend yourself." The top U.S. diplomat also said the Trump administration is dedicated to combating anti-Semitism, and hatred and bigotry in all forms. "With the dark wave of anti-Semitism rising in Europe and in the United States, all nations, especially those in the West, must go to the barricades against bigotry," Pompeo said. On Thursday, the secretary said he and his wife will visit the newly-opened U.S. embassy in Jerusalem, as well as historic and holy sites in the city. Netanyahu's government is headed to a tough April 9 re-election contest as the prime minister is embroiled in a corruption investigation and facing allegations of bribery, fraud and breach of trust. Israeli Prime Minister Benjamin Netanyahu, U.S. Secretary of State Mike Pompeo, Greek Prime Minister Alexis Tsipras and Cypriot President Nicos Anastasiades chat during their meeting in Jerusalem, March 20, 2019. Pompeo, in comments to reporters on route to the Middle East, dismissed the suggestion that his meeting with Netanyahu could be seen as the United States intruding in the Israeli election in support of Netanyahu. Pompeo, speaking while traveling to the region, said the recent U.S. shift away from terminology describing the West Bank and Syria's Golan Heights as "Israeli-occupied" to that of "controlled" by the Jewish state was not accidental. He said that the characterization in a recent State Department report on human rights around the world about Israeli control of the disputed territories "was a factual statement about how we observe the situation. And we think it's very accurate, and we stand behind it." From Israel, Pompeo will travel to his third and final stop on his Middle East trip, Beirut, Lebanon. "We'll spend a lot of time talking with the Lebanese government about how we can help them disconnect from the threat that Iran and Hezbollah present to them," Pompeo said. The United States considers Hezbollah, a militant Islamist political group, as a pro-Iranian "terrorist" organization, even though it is represented in the coalition government of Prime Minister Saad Hariri, a U.S. ally.